Mt. Yatsu-ga-take (八ヶ岳) is a group of 8 inactive volcanic peaks that is listed among the 100 famous mountains in Japan (Nihon Hyakumeizan, 日本百名山). Of all the highest mountains in Japan that I’ve climbed through the years, Mt. Yatsu-ga-take (八ヶ 岳) was one of my favorites. Why? Well, for starters, among the highest mountains in Japan, besides Mt. Fuji, it is probably the most accessible Japan highpoint from Tokyo, as it is possible to reach the trailhead in less than 3 hours from Shinjuku. When I climbed this peak in August 2000, I left Shinjuku by bus early on a Thursday morning and was back in Tokyo by that Saturday night. 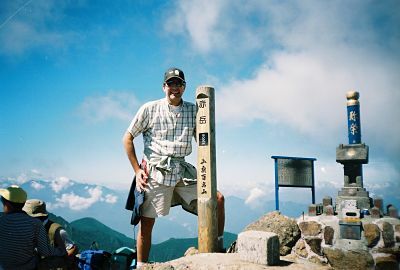 Secondly, even though you gain a respectable 1400m from the Minodo-guchi (美濃戸口) trailhead to the summit of Aka-dake (赤岳), elevation 2899 m, the highest of Yatsu-ga-take’s 8 peaks, the climb is not that difficult. And as I recall, there wasn’t even any scrambling involved. This 1400m elevation gain is comparable to climbing Mt. Fuji from either the Kawaguchiko Yoshida or Fujinomiya Fifth Stations. Lastly, you can’t beat the view from the top. Like Mt. Fuji and Mt. Ontake-san, Mt. 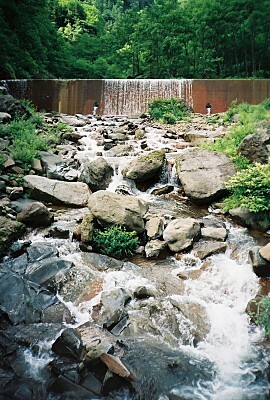 Yatsu-ga-dake is independent & not part of the famous Japan Alps. And so on a clear day, you have an unobstructed view of not only Mt. Fuji, but the Southern, Central, and Northern Japan Alps. Oh, I forgot. I would be seriously remiss not to mention one of the highlights of this trip. And that is, after 21 years of hiking in the highest mountains in Japan, this is the only time I can ever recall staying in a mountain hut up on a hiking trail that actually had a hot spring bath in it. Made from Japanese cypress, no less! Now that was NICE! YEAH!! My Alpico highway bus departed from the west side of Shinjuku Station at 8:30 am and arrived at the Minodo-guchi (美濃戸口) trailhead just before noon. I didn’t hang around the bus stop very long before hitting the trail, and because my goal for the night was the hot spring at the Aka-dake Kosen (赤岳鉱泉) mountain hut, I took the left trail. The trail to the right is the most direct route up to the summit of Aka-dake (赤岳). After about an hour, I reached Minodo (美濃戸), where there’s a group of 3 mountain huts. Here is where a trail branches off to the left, and which crisscrosses the scenic Kitazawa (北沢) mountain stream a number of times while climbing up to the elev. 2340m Aka-dake Kosen (赤岳鉱泉) hot spring mountain hut. Before dinner, women get an hour to soak in the hot spring and then the men get their hour of relaxation. Of course, ladies first! This page shows some other pics of Aka-dake Kosen (赤岳鉱泉), inside & out (scroll down to see them!). The din-din here was very tasty! The 6.5 km trek from the Minodo-guchi (美濃戸口) trailhead up to the Aka-dake Kosen (赤岳鉱泉) mountain hut takes about 3 hours. I got a bright and early start on this gorgeous day and headed 40 min. 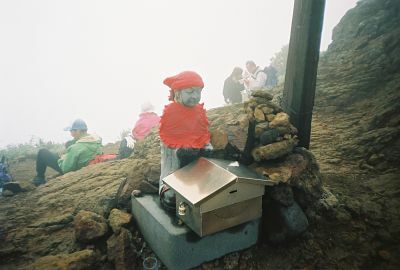 over to the Gyoja-goya mountain hut (行者小屋), where I took the left-hand trail (Jizo-one, 地蔵尾根) ridge up to Jizo-no-kashira (地蔵ノ頭). In Japanese culture, Jizō (地蔵), or Ojizō-sama, is the guardian of children and patron deity of deceased children. In particular, he has been worshipped as the guardian of the souls of children who died before their parents, including stillborn, miscarried, or aborted fetuses. His statues are a common sight, especially by roadsides and in graveyards, and oftentimes in the mountains. Jizō (地蔵) statues are usually seen wearing tiny children's clothing or bibs (usually red-colored), or with toys, put there by grieving parents to help their lost ones and hoping that Jizō (地蔵) would specially protect them. Jizō's features are commonly made more babylike to resemble the children he protects. Jizō (地蔵) statues are sometimes accompanied by a little pile of stones and pebbles (or other miscellaneous offerings), put there by people in the hope that it will shorten the time children have to suffer in the underworld. Jizo-no-kashira (地蔵ノ頭) is where you join the main trail coming over from Yoko-dake (横岳). After hanging a right at this trail junction, it’s just a short distance over to the Aka-dake-tenboso (赤岳天望荘, elev. 2700m) mountain hut which also has a small hot spring. After a short rest here, I headed up the final 200m ascent to the Aka-dake (赤岳) summit. 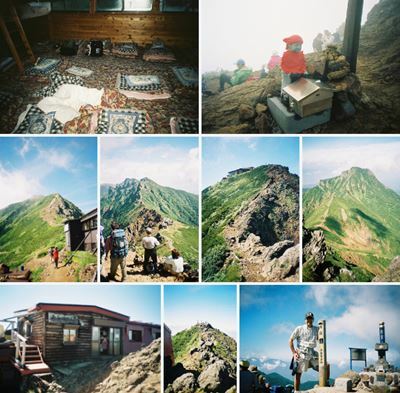 Just before reaching the summit, I passed the Aka-dake Chojo-goya (赤岳頂上小屋) mountain hut, which sleeps 300. The summit of Aka-dake is graced by a couple of tiny shrines as well as numerous small concrete monuments. As mentioned above, the view from the top of Aka-dake (赤岳) was truly stunning. My hike back down into civilization was fairly uneventful, but the gorgeous greenery along the Minamisawa (南沢) mountain stream was very mentally refreshing. 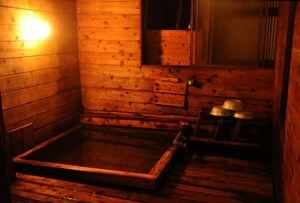 And relaxing in the onsen at my pension in the Haramura Pension Village (原村ペンションビレッジ) was a great way to soothe my aching muscles. Well, I must say the 500-ml can of Asahi Super Dry beer certainly helped improve the mood as well. In the evening, I was hoping to catch the Perseid meteor shower, but unfortunately clouds moved in before midnight. This day was a very relaxing one, since my return bus back to Shinjuku didn’t depart until almost 4:00 pm, arriving back in Shinjuku just before 8:00. I spent most of this sunny day just hiking around doing a little birdwatching, and relaxing in the very amazing nearby Yatsu-ga-take Natural & Cultural Park (八ヶ岳自然文化園), which had a pond, mini-golf, croquet, picnic area, cycling course, flower gardens, and even a planetarium. The pics below are in my Yatsu-ga-take (八ヶ岳) photo album hosted at Flickr. I hope you enjoy them! Click collage above to view my Mt. Yatsu-ga-take (八ヶ岳) pics, taken Aug. 10-12, 2000, back when I still had dark hair. 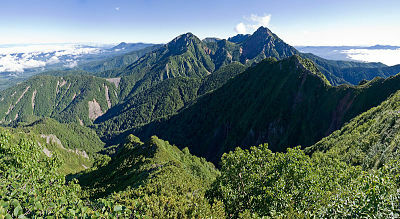 Although as Japan's 33rd highest peak, Mt. Yatsu-ga-take (八ヶ岳) is not among the 25 highest, zooming out on the map below will allow you to see all of the 25 highest mountains in Japan. To my knowldege, the Alpico bus company doesn't provide direct bus service from Shinjuku to Minodo-guchi (美濃戸口) anymore (as it did 12 yrs. ago when I made my trip), but some bus service to Minodo-guchi (美濃戸口) from Shinjuku & Akihabara in Tokyo is now available from the Mainichi Shinbun Travel Service. More info in Japanese is here and @ 03-3216-5346. Another option is to take the Super Azusa limited express train (JR Chuo Main Line) from Shinjuku Station (新宿駅) to Chino Station (茅野駅), and then catch the Alpico bus from there to the Minodo-guchi (美濃戸口) trailhead. The bus schedule from Chino Station (茅野駅) to Minodo-guchi (美濃戸口) is on the Alpico Bus website. Generally speaking, the summer bus runs from late April to early November. The Shinjuku to Chino westbound JR express train timetables are here and timetables for eastbound JR express trains back to Shinjuku are here. Also, there are obviously slower and cheaper ways to get there on JR's Chuo Main Line. More info in English is available from JR East at (050) 2016–1603, 10:00 to 18:00, every day of the year except during the year-end/new year holidays. The fastest Super Azusa trains from Shinjuku Station (新宿駅) to Chino Station (茅野駅) take as little as only 2 hours. And from Chino Station (茅野駅), it only takes about 40 min. by bus or taxi to reach the Minodo-guchi (美濃戸口) trailhead. That's right..... if your train and bus schedules work out right, you can be hiking in less than 3 hours after leaving Shinjuku. Among Japan's highest mountains, this makes Mt. Yatsu-ga-take (八ヶ岳) without question one of the most easily accessible peaks from Tokyo. And if you can get to the Minodo-guchi (美濃戸口) trailhead early enough in the day, because it only takes around 4 hrs. to climb to the summit of Aka-dake (赤岳), many folks do this route as a day hike. My Aug. 10-12, 2000 climb of Mt. Yatsu-ga-take (八ヶ岳) was an awesome hiking trip. From these peaks, on a clear day the views of Mt. Fuji & other nearby peaks in the Northern Japan Alps (北アルプス), Southern Japan Alps (南アルプス), & Central Japan Alps (中央アルプス) will take your breath away. The only drawback about hiking during the busy Obon holidays in Japan, though, is you are certain to encounter crowded conditions on the trails & in the huts. But I guess that just comes with the territory, because like Golden Week and the New Year's holidays, during Obon most Japanese tend to all vacation at the same time, making the trains, planes, and highways pure mayhem. On the bright side, I seem to have noticed a trend in recent years for Japanese companies to start staggering their vacation times a bit, but even in 2012, 25-30 km long traffic jams were typical on the expressways during the Obon holidays. I hope you found this page informative & do please stop by again soon, as I hope to update it in the future with more details on climbing Mt. Yatsu-ga-take (八ヶ岳). In the meantime, if you have any quick questions, feel free to give me a shout by posting them in the "Add your comment" section below or by clicking on the "Contact Me" link at the top right of this page. And if you've already climbed Mt. Yatsu-ga-take (八ヶ岳) & you'd care to pay it forward & share your climbing story & pics with other climbers, we'd love to hear of your personal experience. You can share your story here. If you're lucky enough to hike up any of the 8 Mt. Yatsu-ga-take (八ヶ岳) peaks, I wish you my most heartfelt good luck. GO FOR IT ! !